banaue | let's go pinas!! In a recent visit to Banaue, while my companions and I were at Banuae Hotel, just languidly waiting our time for departure to Manila, in its main hall, there was a curious assembly of public school teachers from many parts of the Philippines. 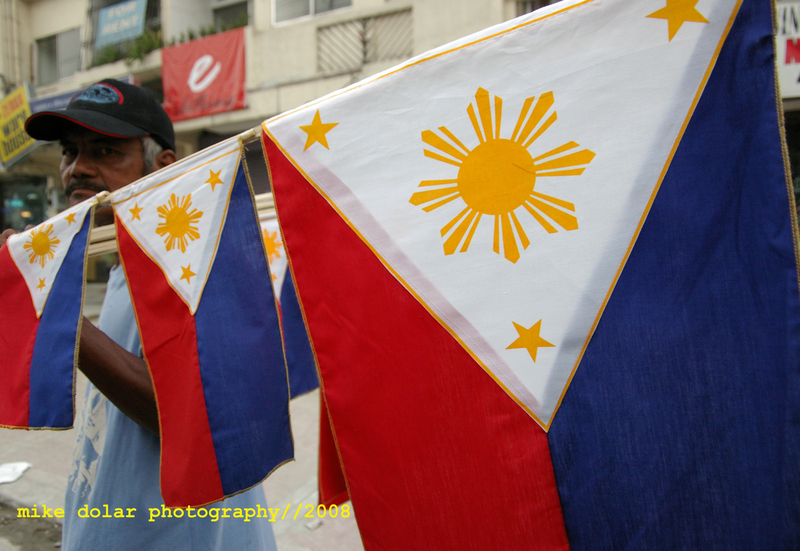 Apparently, the mentors had a one week seminar on how to create national pride in their students, particularly when the students sing the National Anthem and recite the Panatang Makabayan. During that time, the teachers had to sing the anthem properly (and in tune). Also they were tasked to create ways on how to propagate love for country among the young students. I could not believe it. I was elated. Yes, it was the teachers themselves who gave much time for this extra work when they were supposed to be enjoying still their own summer vacations. Moreover, the participants themselves even paid for their own accommodation in Banaue’s poshest place. The teachers needed to prepare a big budget for this vacation seminar, I presume. Thus, it was sadly expected that many other teachers had not been able to come because of the added expense on them. Just the same, hurray for all the coordinators and teachers for their deep concern about how to encourage patriotism for this nation. More specially now, that many don’t even get to sing the exact lyrics of our National Anthem. Not even those professional singers who miserably bang up “Bayang Magiliw” just before a special boxing fight, featuring Filipino pugilists-heroes. Thus embarrassingly, the following day, these singers have become side stories themselves in the newspapers’ front pages. 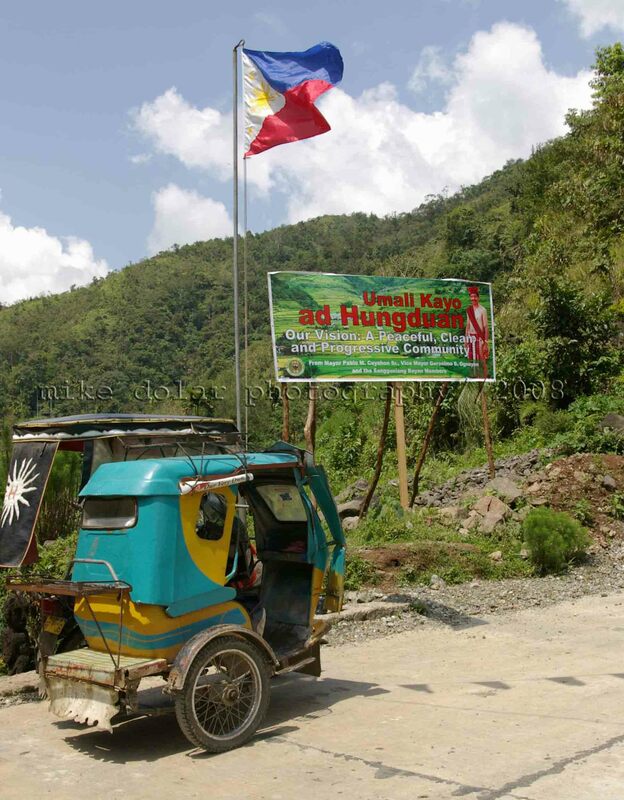 As early as setting foot on Banaue, I got bus tickets for departure to Manila in three days. This was the earliest advice Alex Ordillo had given me. I did not know the man, yet in due time he became our (me and my companions) guide for the visit. A little pushy to say the least to get our business, but he was amiable enough to accommodate our meager travel budget. Instead of getting one jeepney for our sidetrip, he was smart enough to recommend us to use two tricycles (my sole body needed my own trike) thus a better deal for us. During the trip, he asked that we go to his ancestral area at Hiwang. And lo and behold, it was worth the visit afterall. I would have wanted to say what it was, but it is better that readers get to witness it for themselves. Just brace yourselves. Alex seems to be popular among the locals afterall he was once an elected town councilor, and now is the Parent Teacher Association Prexy, and Chairman of the Tricycle Drivers Cooperative. This guy would not hesitate to sing a native ditty as he gave out details of the life and culture of the Ifugaonons. And during the three day stay when we always had rains every afteronoon to spoil our visit, Alex would even give us a little lecture about the weather. Afterall, he was once a weatherman trainee at PAGASA. For those going to Banaue, and interested in Alex’s service, call 0906317-3627/0916994-2390/0919229-6161. As I got out of the Florida Bus Liner, right away I saw a plethora of men trying to catch my attention to be travel guides. Oh yes, they did alright. Well the seemingly bloodied mouths did alright. 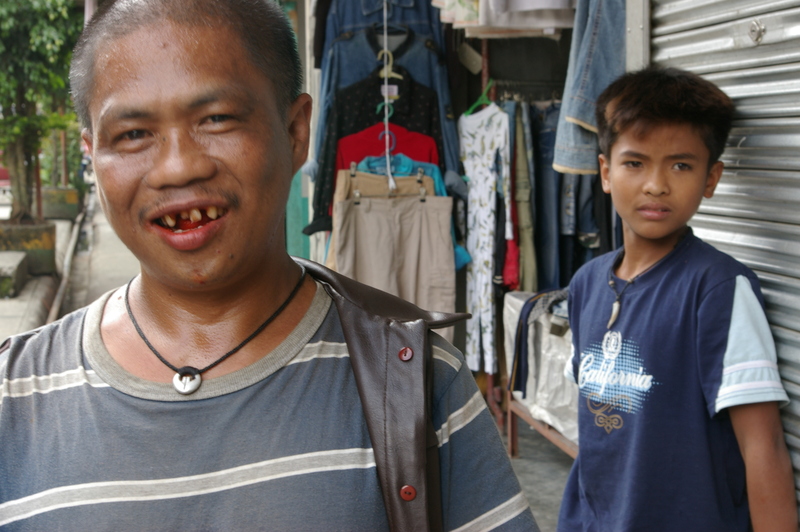 Almost every other guy (and some ladies) in Banaue, chews “nga-nga” which gave out the reddish spit and tarnished the teeth eventually. This chewing concoction, composed of betel leaves, lime paste and tobacco leaf, was prevalent in stores of Banaue at five pesos per plastic wrap. The men reasoned that chewing such combined ingredients gave out a warm sensation in their mouths, perhaps a better alternative to cigarettes. It was no wonder that around the market spit receptacles were in strategic places exclusively for their mouthing habit. As a newcomer, it was disconcerting to see red saliva oozing from one’s mouth. Tuberculosis came easily to my mind. It can be irritating and yet I tried to be tolerant, mindful that I was a guest in their area. 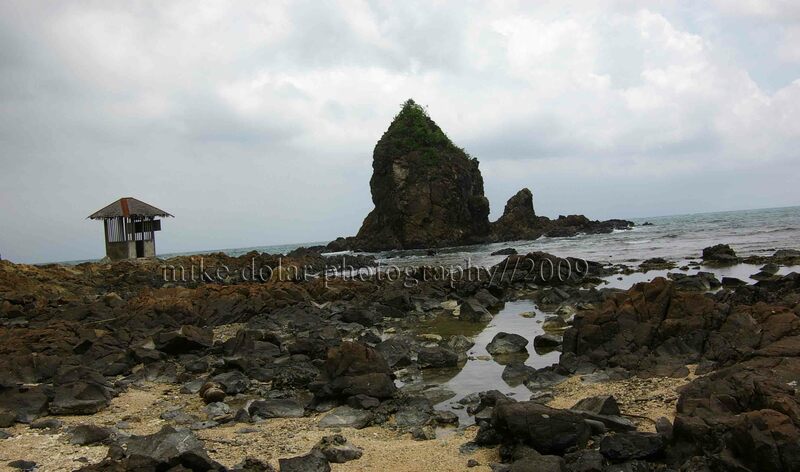 Yet one foreign tourist even had the audacity to scorn the native guide for the habit . It turned out the tourist was a dentist. As I tried to document such custom, I chanced upon a smallish yet rotund guy, sporting a sleeveless leather trenchcoat (straight from the ukay ukay store) and who had the red stuff soaking in his mouth. The guy gamely posed for the camera, with crimson mouth all over. Several snapshots after, he was introduced to me by the ladies who were selling native wooden wares. 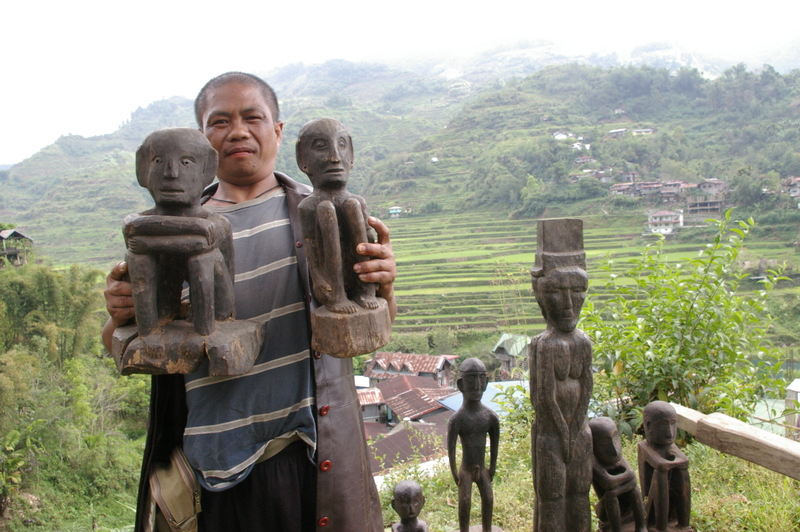 James Humiwat, turned out was supposedly well known in selling a specific native cordillera artifact – the “bulul”. He explained that bululs were native sculptures which should ensure good harvest. 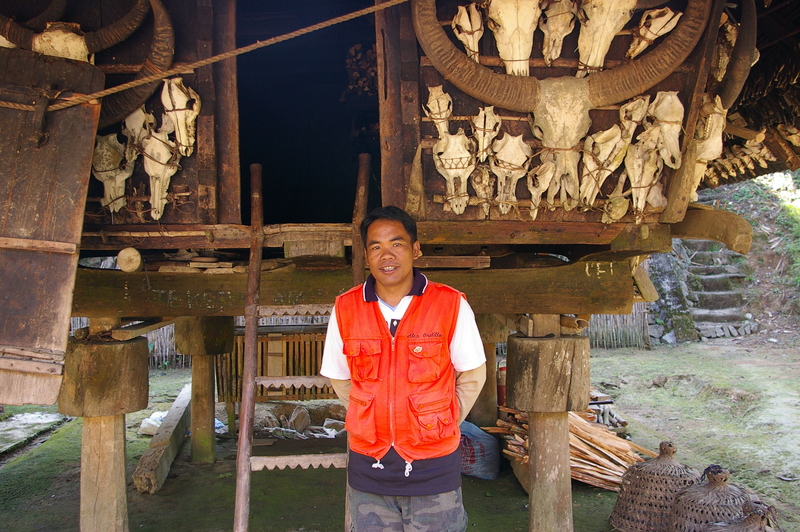 Old tribesmen of Banaue butchered pigs and chicken and poured blood to the idols to have bountiful rice produce. “Original reproductions, but not antiques,” he cautioned. He prompted to explain classifications of original reproductions (30 to 40 years old), antiques (older than 40 years old), and replicas (newly carved and for décor purposes) of harvest icons. 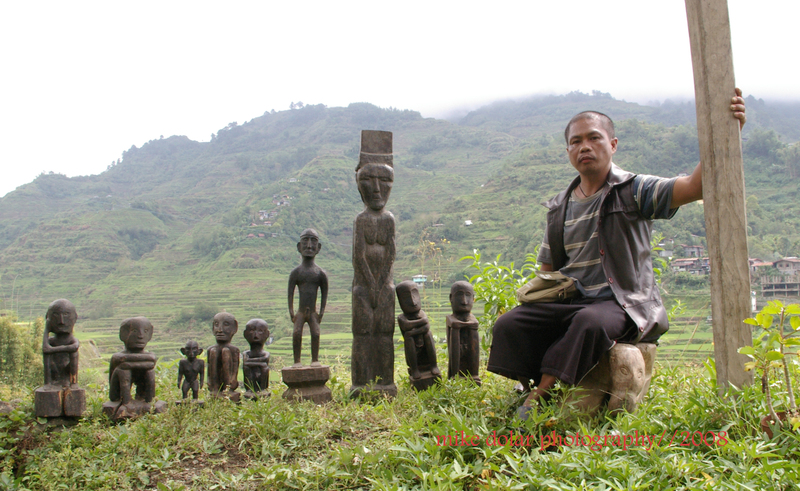 He then asked me to check the pieces personally in his home atop a boondock overlooking a splendid sight in this part of Banaue. He narrated that many times he would go down the mountains and brought some of the pieces to well known antique shops in Ermita, Manila, particularly to a family recognized in selling Filipino artifacts. And the relics were sold to the public from 5 to 15 thousand pesos. “I hope they were legally taken out of the original homes,” I thought. Of course, I was not sure of the market price of the said articles nor the veracity of his claims that such treasures could be categorized as original “repros”. After another round of snapshots with the picturesque mountains behind, he would meticulously put back each “bulul” to his humble hut. Then without notice, James went back mouthing a betel chew as we descended from his place.